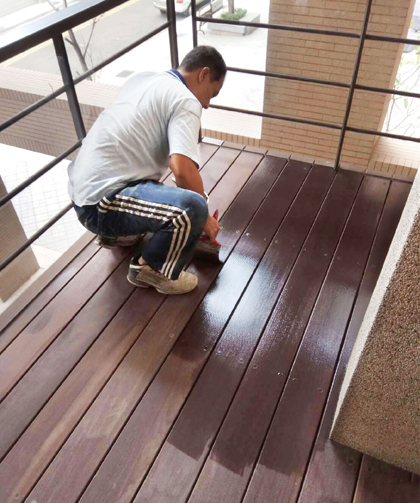 Wood Plastic Composites when exposed to sun rays and rain for long period of time, the ultraviolet rays will cause surface oxidation; bleached whitening effect on the surface of wood plastic composite products, Wood Plastic Composite Protective Water-based Paint when apply to the surface, will effectively block the ultraviolet rays, effectively reducing the oxidation phenomena and protect the surface of the products, thus enhancing the outdoor weathering resistance. ◆Environmental friendly Tested by SGS professional organization, it is free from heavy metals, formaldehyde,... and other toxic substances, non harmful to human body and the environment. ◆Durable Abrasion resistance, ultraviolet resistance, lasting colour brightness, lasting adhesion, non crack, non peeling. ◆Safety Non flammable, non irritating odour. ◆Easy to use Stir well before application, easy to brush, fast drying and time cost saving.